From beautiful skin to a platform for aspiring models to clothes and accessories that make heads turn, Ruhuu25 Events, a firm catering to the media industry as well as the general people, has a lot to offer. Another venture of Ruhuu25 Events involves its collection of clothes and accessories, named Ruhee & Style, which is located in Navana Tower (Shop # 1, 1st floor). Ruhee & Style -- to say the least -- is a retail store for clothes, accessories, etc. But another side of Ruhee & Style is its customised clothing lines for various occasions, like drama serials and TV shows. Catering mostly to people from various media, Ruhee & Style makes customised attires, costumes, accessories, etc. tailor-made for specific needs. Ruhuu25 Events also believes in giving back. That is why it has yet another concern, named Kacher Manush, which is a drive by the organisation that promises to use a minimum of 20 per cent of its profit for charity. Ruhuu25 Events indeed has a lot on its plate; after all, the media industry is huge and comes with never-ending needs and demands. Facilitating them is no easy business. But Ruhu25 Events is there to help you, whether you want to be a model or whether you are from the media looking for unique costumes and accessories of a specific kind, or whether you are just a person looking for a little help in beautification or fashion. For further information, call 0171 699 3252 or 0167 690 1970, or email at ruhuu25@gmail.com. I never got to hear Ravi Shankar play live, although I have had the opportunity many times. Regret is all I am left with now that the great sitar maestro has left us forever. 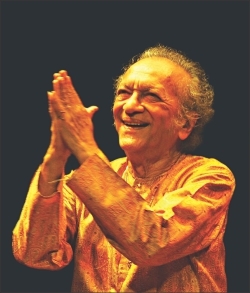 Ravi Shankar was a cultural ambassador of India; he was an envoy of Bengali culture. But truly the identity that will forever be associated with Shankar is that of a devoted, loyal friend of Bangladesh. Even as early as April 1971, Ravi Shankar had put forward the idea of a charity concert, for the benefit of the thousands of refugees from the then East Pakistan who had fled to India, with George Harrison -- his friend and apprentice. By the end of the conflict a near ten million refugees had fled to India and over 250,000 dollars was raised by the two Concerts for Bangladesh that were held in 1 August, 1971. George Harrison assembled a star-studded musical event, comparable only to Woodstock. The ensemble -- Ravi Shankar, Ali Akbar Khan and Alla Rakha performing on stage was an event in itself. It was a showcase of pure Indian vibes for the first time to a western audience, even though each of these great figures had already made a name for themselves. Even back then, they were each stars with iconic status. “In one day, the whole world knew the name of Bangladesh,” Shankar said in a book. “It was a fantastic occasion and I think it was the first of its kind. Now, of course, wonderful things are done, so many musicians are raising money for different causes. But the Bangladesh concert, I think, was the very first one,” the sitar wizard added. I was not even born when the Concert for Bangladesh was staged. But I will forever remember the impression Shankar's “Bangla Dhun” created in my juvenile mind. And each and every time I go back to Shankar, Ali Akbar, Harrison et al I discover a new facet of my Bangladeshi identity. To me Ravi Shankar was not only a musician who spoke of our culture. Ravi Shankar was a true friend of Bangladesh. And after December 11 2012, we will miss a friend. Excerpts from the song “Bangladesh” by George Harrison. How is the winter treating you, dear readers? It's festive here in the US. Houses are lit, and the stores are prettily decorated with red, green, snowflakes and glitter. Jingle bells and other holiday tunes are playing everywhere. 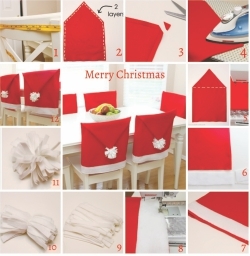 In the spirit of the festivities, we will be making Santa-hat chair covers for your dining room chairs. Measure your chair's width (at its widest) and the height of the back section; see picture 1. Since we don't want the cover to reach all the way down to the seat, cut the felt 2 inches above the chair's seat section. We need the main rectangle shape of the cover; mine was about 19 inches wide and 18 inches tall. We need the top edge to have a triangle shape (resembling a Santa-hat), which I made about 10 inches tall from the top point, down to where the main rectangle shape begins; see picture 2. Cut out 2 of these shapes but add 1/2 inch on all sides (except for the bottom). Place the shapes together and sew along all of the edges except for the bottom, using a 0.5-inch seam allowance. Trim off the 3 points, and turn it right side out and iron (low-heat) flat; see pictures 3 and 4. Sew a straight line across the top of the chair cover where the triangle shape and the rectangle shape meet; see picture 5. This will keep the chair cover in place and will stop the cover from sliding down the chair. Cut a 2.5-inch wide piece of white felt that is the same width as the bottom of the chair cover, plus a 0.5-inch at each end, for the seam allowance; see picture 6. Sew the two ends together with a 0.5- inch seam allowance, and turn it right side out; see pictures 7 and 8. Slip it on around the bottom edge of the seat cover by placing the side seam of the white strip right on top of one of the side seams of the seat cover. Match the two bottom edges of the white strip and the seat cover and sew the two layers together using a 0.25-inch seam allowance. Sew another seam along the top edge of the white strip. Cut about 40-50 long strips of the white felt, each about 0.3-inch wide and 4-inches long; see picture 9. Wrap a long piece of the upholstery thread around the middle of the felt strips and pull tight; see picture 10. Wrap a few more times and tie knots several times, and fluff up the pieces to make a pom-pom; see picture 11. Hand-stitch or hot-glue the centre of the pom-pom to the tip of the hat part; see picture 12. Your little Santa-hat Seat Covers are ready! Christmas, like other holidays, is full of traditions and cheer. I hope these recipes will help spread the holiday spirit. This recipe is low fat and low calorie, sugar and dairy free, and delicious even without all the icing regular cakes have. Preheat oven to 160 C. Line a loaf tin with baking parchment. Put the dates and water into a small saucepan, gently bring to a simmer and keep on low heat for a few minutes until the dates are soft and have absorbed the water. Mash them up a bit with a wooden spoon. Add in the orange juice. Mix the dried fruit, flour, cocoa powder and baking powder along with the spices and a pinch of salt in a large bowl. Put in the dates and lemon or orange zest and mix well to combine. If necessary add in a little extra orange juice to make a slightly sticky mixture. Stir in 1 or 2 tablespoons of brandy (optional -- this is ideal for a Christmas cake). The mix should be stiff but not too dry. Fill the loaf tin with the mixture, and make a pattern on the top with the almonds. Bake for 1½ hours, but check after 1 hour and 20 minutes by inserting a skewer into the centre of the cake. The skewer should come out clean. Note: If the nuts look like they are browning too much place some baking parchment or foil very loosely over the top of the cake for the last 30 minutes of baking. Preheat oven to 180 degrees. Line a large baking tray with baking parchment. In a large bowl, cream the butter and brown sugar together using an electric mixer. Add egg and vanilla, and mix until blended thoroughly. Whisk together flour and salt in a small bowl. Gradually add the flour mixture to the wet ingredients, and mix with a wooden spoon, forming a large ball. If the dough is sticky, refrigerate for an hour before continuing. Otherwise, go ahead and form 1 inch balls and place them 1 inch apart on the cookie tray, making a deep thumbprint in the centre of each. Bake for 10 minutes. Remove from oven. After one minute, place on a wire rack to cool. Add a little raspberry jam to the centre of each cookie. What is the connection between winter and barbeque parties? How come, in this season, we become so enthusiastic about throwing chunks of raw meat on the grills over the coal? One good answer is probably winter itself: we feel comfortable and cosy near the fire; the heat is a relief, a break from the cold nights. Other than your rooftop, Ruposhi Bangla Hotel this season is also an outstanding location to have a barbeque dinner with your friends and family. Situated at the poolside beside the restaurant Italia, Ruposhi Bangla is arranging barbeque nights every Friday from 7pm to 11pm. The flaming gastronomic adventure will continue till 1 February, 2013. Friday is a day reserved for loved ones. The whole week is booked for work, and Friday is the break we all wait for. Hence, the barbeque nights at the hotel are on Fridays. Also, barbeque is a genre of food that is enjoyed by all age groups, which makes it a good meal for the whole family. The buffet comes with a price tag of Tk.2400 inclusive of VAT and service charge. With live barbeque stations a part of the buffet table, the items promise a wholesome meal, from the mouth-watering starters to the main course which comprise numerous items such as steak, tomato rice, lamb chops, saslik, and several types of grilled meat. The list does not end here of course. One must always leave enough room for the sweet treats to end the meal. The barbeque meal also comes with an attractive promotional drinks offering. The poolside is, by itself, a relaxing place to be. During the night, with the water very calm and timid -- except some shimmering tricks played by the surface with the aid of the lighting around -- the poolside is indeed a serene place to be. Add food and music to that, and you have a recipe for happiness. Food is just a part of the whole equation. The barbeque nights also host live unplugged music shows to entertain the guests. There is always a tone of celebration and joy in live, acoustic performances. They never fail to lift the mood. The band plays mainly English and Bengali numbers. Bengali folk and traditional songs are very popular among the foreign guests too, the hotel informed. The classic Bengali numbers, or some English tracks from the 70s or 80s that you have long forgotten will surely take you on a journey down memory lane, making the night even more special. Good food, good music and good company -- that's what keeps us alive.